Kenyan President Uhuru Kenyatta has been declared winner of a controversial re-run of the presidential election. He won 98% of the vote with turnout at just under 39% - less than half that recorded in August's vote, according to the election commission. The opposition leader, Raila Odinga, pulled out of the re-run and urged his supporters to boycott it. 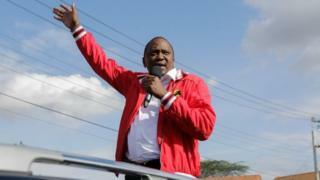 Mr Kenyatta was also declared the winner in the August vote, which was annulled because of "irregularities". The unprecedented decision from the Supreme Court cancelling the result did not attribute any blame to President Kenyatta's party or campaign. The re-run was suspended in 25 constituencies which are all opposition strongholds amid security fears. The election commission said those results would not affect the final outcome so it could proceed with its announcement. Commission chairman Wafula Chebukati described the latest vote as "free, fair and credible". Last week, before the election re-run, Mr Chebukati had cast doubt on the credibility of the poll. He was speaking after one of the election commissioners fled the country, saying she feared for her life. Kenya's opposition now has seven days to mount a legal challenge, and Mr Odinga says he will make an announcement on Tuesday. Mr Odinga boycotted the re-run because he said that no reforms had been made to the Independent Electoral and Boundaries Commission (IEBC) after the Supreme Court found irregularities and illegalities in the original poll. Mr Kenyatta, who is now set to serve a second term, said if the new results were challenged in the courts he would accept the outcome. "Those who are going to ask me: 'Are you going to engage in dialogue? '...Let them [the opposition] first and foremost exhaust all their constitutional options," he said. Appealing for calm he said "your neighbour will remain your neighbour despite the political outcomes". About 50 people are reported to have died in violence since Mr Kenyatta was declared the winner of August's election. News of his victory in the re-run triggered minor skirmishes on Monday between police and a handful of Mr Odinga's supporters in opposition strongholds. Mr Odinga had wanted the repeat ballot to be held at a later date, but a bid to delay the election re-run fell apart after only two of seven Supreme Court judges attended a hearing last week. There was a sense of relief, as well as déjà vu, at the national tallying centre, when the chairman of the electoral commission said Uhuru Kenyatta had won the presidential election - this time with a little over 98% of votes. Kenyans are tired of political wrangling, legal challenges, and repeated elections, but it's unlikely this will be the end of the matter. Opposition leader Raila Odinga, who called on his supporters to boycott the ballot, is expected to reject the result - given the low turnout and continuing legal challenges. The Supreme Court still has to consider a petition questioning the legitimacy of the poll, and given the ambiguities over electoral law and the way the constitution is interpreted, further legal arguments are expected. There have been violent clashes between opposition supporters and police in parts of Nairobi and western Kenya and how Raila Odinga takes this defeat will determine Kenya's path over the coming days and weeks.